Rax 2.0, a music utility from plasq, the creators of Comic Life, brings the same kind of easy access to virtual musical instruments and effects plug-ins that AppleÃƒÂ¢Ã¢â€šÂ¬™s Front Row provides for music, videos, and photos. With a virtual mixer, a facility for creating custom songs and sets, and a full-screen OnStage mode with support for live visualizers, this radically redesigned new version makes playing live music with your Mac easier than ever before, for both the casual musician and the gigging professional. It acts as a digital hub for instruments, effects, and visuals in the studio and on stage. I’m really impressed with the utility, particularly for its innovative interface, and the ease with which it allows you to manage songs and sets for performances. I’m surprised, honestly, that more Mac musicians haven’t noticed Rax, so feel free to spread the word to those who would benefit from it. 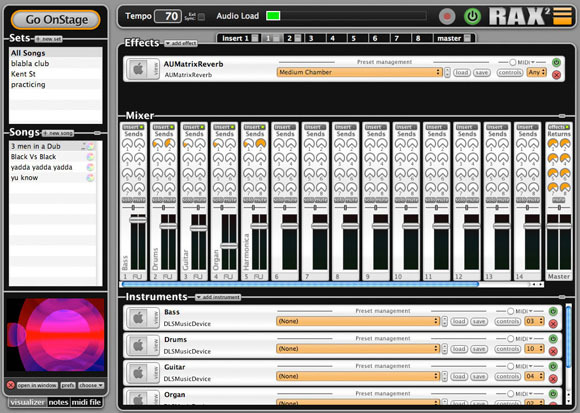 I wish software like Ableton Live had the same kind of set management features. The only real bad news, through no fault of plasq’s, is that you’re restricted to using Rax with plug-ins; it doesn’t work with built-in instruments and effects from GarageBand, Logic, or Live. If you’re a Logic user, you’re in luck; see OnStage. But it’s too bad there’s no seamless solution for managing sets in Live, an otherwise brilliant tool for live performance (hence the name). Rax is also notable for its ability to switch fluidly between visuals generated in Quartz Composer, the free Mac developer tool and visual synthesizer. Rax comes with a rich set of sample visuals built in QC, and you can add your own. It might be worth a look for this feature alone, if you’re a Quartz Composer fan, particularly since it lets you work around some of the issues with getting MIDI and audio input into QC so that your visuals follow your playing. Watch Create Digital Motion for a follow-up story on that, or the previous story from CDMusic below. I’m working more with Rax and hope to share some power tips with the program soon, including some hacks for making it work with Live via AppleScript. Stay tuned. Feel free to share your feedback or questions on Rax and the review here.